Why are we talking about governance? We have found that one of the biggest problems in the non-profit sector is the lack of understanding and daily reference to the role governance plays. Although people accept that corporate governance is par for the course in the business sector, non-profits are often too busy ‘doing the doing’ and can see legislation as something to deal with or react to, rather than as a tool to attract more support for the work they do. In April 2009, Inyathelo made a submission to the King Committee, which had been appointed by the Institute of Directors (a membership-based organisation of corporate directors) to revise the Code of and Report on Governance Principles for South Africa (King III). We did this because King III did not take into account the unique circumstances in which non-profit organisations are established and managed, and the environment they operate in. The submission was supported by 57 other organisations but it was not taken into account by the King Committee. 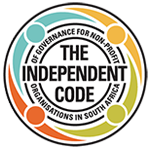 After two years of extensive consultation with hundreds of organisations and individuals across the country, a working group, spearheaded by Inyathelo, published The Independent Code of Governance for Non-Profit Organisations in 2012. The Code has become available for adoption by the sector – sign up is voluntary. Ultimately, this code promotes good governance, high standards, integrity, and best practice amongst NPO. In having a standard measure like this, government and donors are able to establish a trusting relationship with a non-profit signatory. Knowing that the right structures are in place and decision structures are set up correctly is crucial for donors, who want to know money is being handled correctly and invested in the public good. Without a formal approach to governance, a non-profit is in danger of being perceived as an organisation that has the power invested by money, without the right expertise to know how to manage it. This is a big deterrent for donors who are becoming much more stringent on who they fund and what they expect. Inyathelo foresee that the Independent Code will become the standard by which governance in the non-profit sector is measured. Click here to follow up on this information by reading the Why the Code of Governance? article.